From West of the freeway in Northern Utah come Western Music Association performers STAMPEDE! – a multi-award winning Western music duo that brings good music (classic and original), harmony, humor and just down right good fun to the stage. From state fairs to county fairs; large gatherings to small neighborhood BBQs, STAMPEDE! delivers the absolute best every time and will leave you laughing or crying but you’ll go away knowing you have been entertained by one of the best groups in Western Music today. 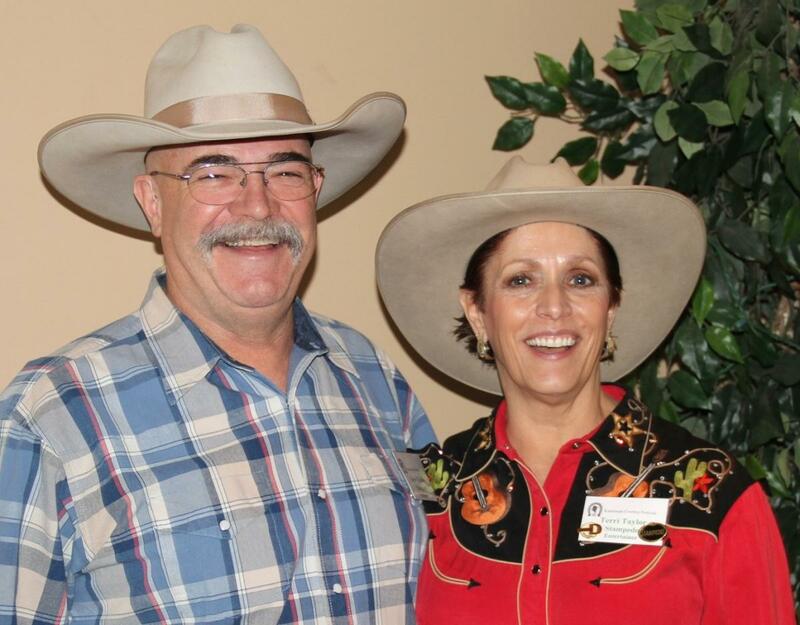 The group is made up of the husband/wife team of Steve Taylor, “The Safest Driver in the West” and pretty darn good on that upright bass and Terri Taylor, dubbed “The Epiglottis Goddess” and labeled “a Triple Threat” by Ranger Doug of Riders In The Sky. They were also recognized by the Western Music Association with the Crescendo Award in 2006. STAMPEDE! has been performing throughout the West since 2000 and has been going strong since then averaging 250 performances a year. (For a period of time, they performed as a trio). They have opened for or shared the stage with major headliners including Riders In The Sky, Roy Rogers, Jr., The Sons of the Pioneers, Dan Seals, Rex Allen, Jr., Wylie and the Wild West, Baxter Black, Red Steagall, Don Edwards and Waddie Mitchell and Belinda Gail. They have headlined in major shows in every state in the Intermountain West. 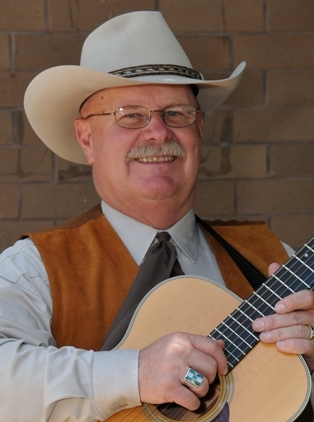 Santa Clarita’s own John Bergstrom is a performer of both traditional and original music from and about the West. Since joining the Western Music Association, he has released his debut CD, “Western State O’ Mind,” and recently released his second CD, “Throw Down the Box.” John has performed at a variety of events including festivals, coffee shops, restaurants, community fund raising events, and local radio shows. I’m a child of the West … the far West … Los Angeles. I’m a city kid who has always loved the open spaces. I was raised on cowboy movies and western displays at museums wherever I could find them. I’ve been involved with music all of my life and have touched Western Music at various times. It’s been these last four years, however, in which I focused on this form of traditional music to the exclusion of others. My first CD, Western State O’Mind, features an engaging combination of original and traditional songs. “Tiburcio Vasuquez” was a real Californio bandito in the mid 1800s. His most famous exploits happened in what’s now the northern part of Los Angeles County up to Monterrey County. He viewed himself a revolutionary according to most sources I read. This colorful figure needed a song. The poem “1876” comes from a remarkable and important year in U.S. History. A bunch of events took place in the year of our national centennial. “Western State O’Mind,” the title song for this project reflects my pleasure at driving through the Southwest. Yes, I was driving East, but I was still hunting my Western State of Mind. The growth of Los Angeles has always been fueled by the need of water. The “St. Francis Dam” north of L.A. was intended to save several months of water supply for the city. When the dam collapsed, about 500 people died. “Latchkey Cowboy” celebrates my childhood watching my heroes on TV. If you’re a baby boomer enough, you might relate. Finally, “Cowboy Waltz” tells my appreciation for the Cowboy Way. If we don’t watch out, we might lose it.